University of Maine campus in Farmington, Maine. Farmington is on the southeastern edge of Franklin County. The county itself is named after Benjamin Franklin. In a way that gives Farmington, the county seat, a historic edge. At the same time that is one important name to live up to. Downtown Farmington became one of the most innovative and organized of the newly founded towns in New England. Long before the first automobile rolled off the assembly line, Farmington initiated two-way traffic laws. Today that may not seem like such a big deal, but in the world of horses and carriages, it was an innovative step. Benjamin Franklin, a visionary in his own right, would be well pleased. The first European settlers arrived in what is now Farmington in 1776. Their timing could not have been worse. The Revolutionary War was in full swing. That, and the aftermath, delayed settling the area until 1781. Log cabins were built on what is now Farmington Falls, a fairly level, cleared area once used by Native Americans to grow crops. The fertile land produced hay, apples and provided grazing for thousands of sheep, putting Farmington on the map as a major wool production town. The Sandy River runs through town. That and the smaller Wilson and Temple streams provided power for a number of factories. The area prospered, even more so when Farmington became the southern terminus for the Sandy River Railroad. This made getting to Sugarloaf Mountain and Rangeley Lake much easier. This narrow-gauge railway no longer operates commercially. It was re-opened as a tourist attraction, under the name of Sandy River & Rangeley Lakes Railroad. Volunteers restore the trains and offer seasonal weekend rides. Though the area is home to a number of niche farms, today Farmington is more of a college and resort town. 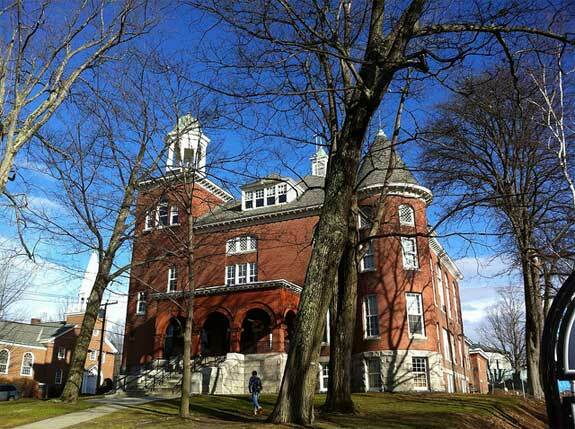 The University of Maine at Farmington, the foremost liberal arts campus in the state, is in the heart of downtown. The UMF Art Gallery is worth a visit, as are the galleries in the downtown core. Rollo Park, the Nordica Homestead Museum and the Farrington Historical Society are all interesting stops. Titcomb Mountain, in West Farmington, is home to the Farmington Ski Club. Each January the resort hosts the Nensa to Bank Pine Tree Eastern Cup Race, a three day sprint and classic freestyle race. Other local events to look out for in Farmington include the December celebration of Chester Greenwood Day, including the Festival of Trees. In summer, look for Art in the Park, the annual Summer Fest and Farmer’s Markets, offering local goods. The Farmington Fair is held every September. Most of the restaurants are clustered around the downtown area, on Main, Front and Broadway Streets. They range from locally owned pizzerias and gelato shops to home-style bakeries. Most motels are found along Routes 2 and 4, south of the town core. A number of campgrounds are nearby. Wilton, just west of Farmington, dates back to 1803 and is the site of Maine’s first cotton mill. G.H. Bass & Company was also founded in Wilton. The firm had bragging rights because a pair of its shoes was worn by Charles Lindbergh when he made his famous Atlantic flight. Bass created the “penny weejun” style, later known as the penny loafer. The Wilton Farm and Home Museum is housed in the Bass family home, now listed on the National Register of Historic Places. Every August the Wilton Blueberry Festival celebrates this small round blue fruit. Sample blueberries made into flaky crusted pies, jams and ice creams. Arts and crafts vendors, music, carnival style games and even more foods are available. Kineowatha Park, near downtown, fronts Wilson Pond. To the north, via Route 156, are the Wilson Lake Country Club and its golf course. Most accommodations are in nearby Farmington, but Wilson Lake Inn is on the western shore of Wilson Pond, offering year round recreational activities. The town of Weld surrounds Webb Lake, fed by mountain runoff and filled with a healthy fish population. Anglers come to paddle out in canoes and cast their lines in the cool, clear waters. In 1929 two enterprising brothers got the idea to build a fishing lodge. They put up cabins and a main central building which would later become the Kawanhee Inn. Nearby they built Camp Kawanhee, a Boy’s Camp. The inn and its dining room have entertained royalty and statesmen over the past 80-plus years and the venue is still growing strong. The southeastern corner of Weld is taken up by Mt. Blue State Park, offering even more outdoor adventure opportunities. Weld, incorporated in 1816, is named for one of the former owners of the land, Benjamin Weld. Avon was an agricultural village that relied on the Sandy River to irrigate their crops of wheat, vegetables and fruit. By 1837 the population reached 767 and the area ran two sawmills. By 1897 the Sandy River Railroad was transporting lumber and several thousand bushels of wheat annually to Farmington. The railroad is now gone and the population about half what it was in Avon’s heyday, but the town shares one of Maine’s jewels, Mount Blue State Park. Visitors come to fish, swim, canoe, sunbathe on the sandy beach and spend a night or two in the lakeside campground. Nearby Chesterville is half the size of Avon, but with twice the population. The Chesterville Wildlife Management Area is in the center of the township. Norcross, North and Locke Ponds provide fishing opportunities. The town of Industry wraps around Clearwater Pond, sitting off Route 43, or Industry Road. Most of this area is open land. New Sharon, also lightly populated, sits on either side of the Sandy River, northeast of Chesterville. Farmington Falls Road bisects the township. Phillips, north of Avon sits on land that was once a plantation, circa 1790. It fronts the Sandy River and the water powered sawmills and other local factories. The Sandy River Railroad connected the town with Farmington and other areas in Franklin County, increasing the area’s productivity. The Sandy River Festival is usually held in the nearby township of Strong, once labeled the “toothpick capital of the world” because of the Strong Wood Products plant. At one time it made nearly 20 million toothpicks each day. Temple, just west of Farmington, is known for its Temple Historical Society, housed in a little red schoolhouse that is on the National Register of Historic Places. Visit the following directories to find lodging, dining, attractions, shops, services and recreational activities in the Farmington, Maine area.